Situated on the edge of Dyffryn Ardudwy village 4 miles north of Barmouth. 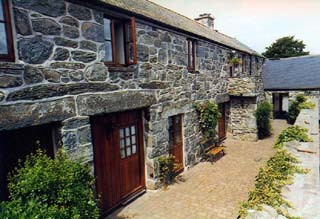 The accommodation has been created from traditional stone farm buildings. 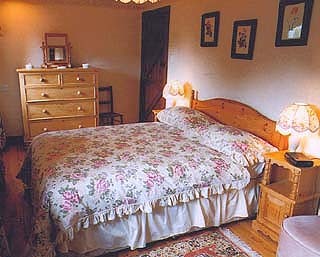 All are furnished and equipped to the highest standard, reflecting farm house style and comfort throughout. Sleeping up to four people. All have been awarded highest grade of five stars by The Wales Tourist Board. Llofft Allan and Beudy Bach each sleep two and are ideal for romantic couples or for those seeking peace and tranquillity with easy ground floor access. The bedroom can either be double, twin or king size and have en-suite facilities with bath and overhead shower. Living Rooms have ample comfortable seating and are equipped with colour television, video player and music system. Daflod and Sgubor each have a double and a twin bedroom with en-suite bathrooms and Rhiwal our upside down house also has a double and a twin bedroom. All have gas-fired central heating and a living flame gas fire to warm those cool evenings. Kitchens are well equipped with gas cooker, fridges, dishwashers and microwaves in all and freezers in most. 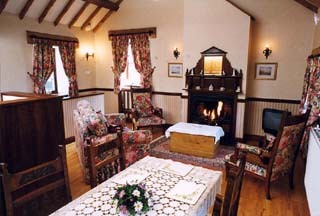 Bedrooms are charmingly furnished and all the beds are made up ready for your arrival. there are continental quilts with extra blankets if required. Open fire, full gas central heating. Gas, electric and coal included. Royal St. David's golf course, pony trekking, mountain and country walks, lakes, rivers, fishing, sailing and sandy " blue flag" beaches of the Cambrian coastline. The Wales Tourist Board highest grade of five Stars. Superbly equipped and tastefully furnished. Welcome Host Gold Award— Farmhouse award.